The Stowaway also stores the Guardian at the rear of your motor home. The Stowaway also has a center cut-out for quick and easy access to most motor home. electrical components. An additional feature is a drop-down collar with a pull-pin design that allows you to easily remove the Stowaway for access to the rear diesel compartment - without having to take the tow bar offFeatures. 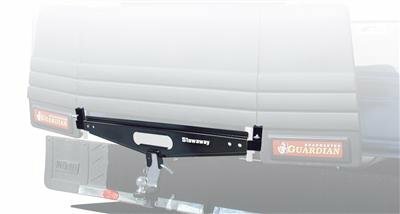 Stores The Guardian At The Rear Of Your Motor home.. A Center Cut-Out For Quick And Easy Access To Most Motor home Electrical Components.. A Drop-Down Collar With A Pull-Pin Design Allows You To Easily Remove The Stowaway For Access To The Rear Diesel Compartment.Specifications. Weight - 20.0000.. Used To - Store The Guardian Rock Shield Rear Of The Motor home.. Color - Black. Stores The Guardian At The Rear Of Your Motor home. A Center Cut-Out For Quick And Easy Access To Most Motor home Electrical Components. Used To - Store The Guardian Rock Shield Rear Of The Motor home. If you have any questions about this product by Roadmaster, contact us by completing and submitting the form below. If you are looking for a specif part number, please include it with your message.